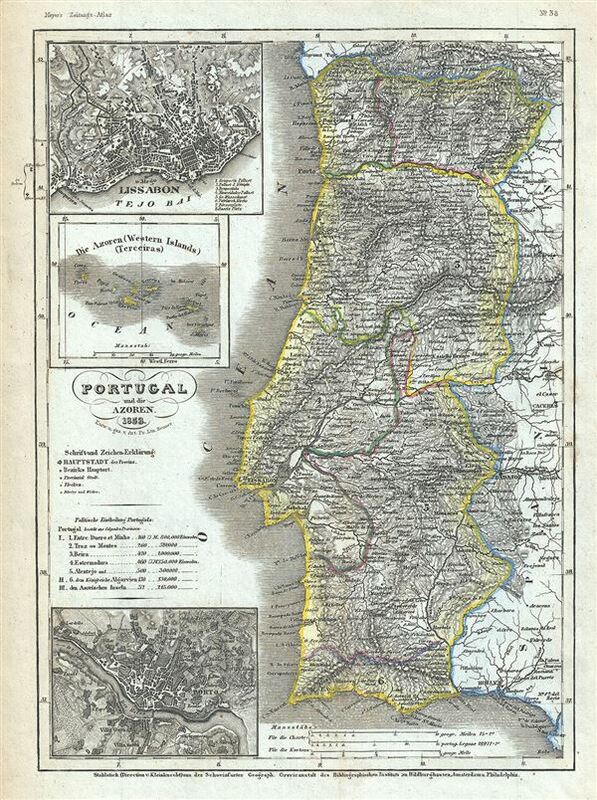 This is a beautiful 1853 map of Portugal by Joseph Meyer. It covers the entire nation of Portugal as well as parts of neighboring Spain. Includes an inset of the Azores or Western Islands. Another two inset maps featuring the vicinity of Lisbon and Porto are included in the left top and bottom quadrants respectively. The map is extraordinarily detailed and notes several rivers, towns, cities and topography, with elevation rendered by hachure. This map was issued as plate no. 38 in Meyer's Zeitung Atlas. Although all the maps in this atlas are not individually dated, the title page and maps were often updated while the imprint with the date was not, causing confusion to the exact date for some of the maps. Moreover some maps in the atlas were taped in at a later date as an update to the atlas. We have dated the maps in this collection to the best of our ability. Very good. Minor overall toning and spotting. Blank on verso.